You have made an old man extremely happy, revamping my bathroom to a modern, easy to use, walk-in faciltiy in a very professional manner, you are a credit to your trade. Thank you, staff and tradesmen. We are delighted and will both enjoy our new bathroom. Thank you for sending out the information so promptly. The times I have used Able Care have left me very impressed by the staff's helpful nature. Thank you for your help, reliability and excellent measurer and fitters. The boys were good. They made a lovely job of our shower room and they were clean and tidy. 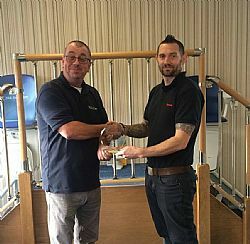 We would like to thank Able Care and all involved in the good, efficient and pleasant service we received in the fitting of N's stairlift. To Able Care and the great group of lads: joiner, electrician, plumber and brickie... what a difference this has made to my life. Thank you. I would like to express my appreciation for the quality of the fittings and for the workmanship of your two men who did the job. They were considerate and courteous at all times and wasted no time. Many thanks for everything you and the chaps did - and for your endless patience. A big thank you. Life made easier for us.